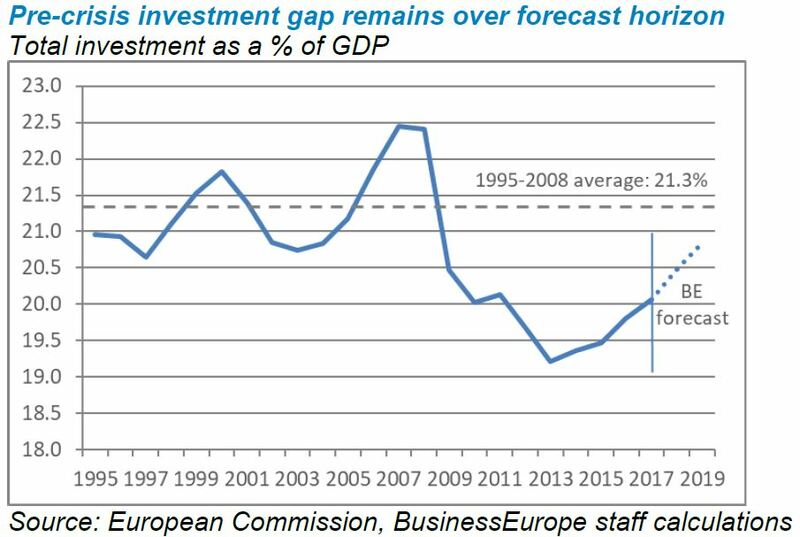 With the crisis the EU has seen investment fall as a share of GDP to its lowest level in 20 years. Private investment contracted by more than 11% between 2007 and 2013. Though investment started recovering since, it has been at a very slow pace and has not yet bridged the gap from pre-crisis levels, also remaining behind the one of major competitors. The commitment of the European Commission to prioritise investment is very important, but we need adequate follow-up in order to address barriers to investment that have been identified. Resources must be mobilised to projects that have a positive impact on growth and employment creation, avoiding past mistakes when public investment addressed little economic demand, and subsequently remained idle or under-utilised. In the long term we will only increase investment if we improve the EU investment climate and reduce obstacles to investment, ensuring Europe becomes an attractive place to invest in. This is the most important piece of the investment challenge and we are eager to see effective action in this area. Removing barriers to investment means reducing unnecessary and overly expensive regulation, bringing down costs of doing business, allowing better access to finance and scrapping barriers to the single market.